I loved word search puzzles as a kid. So did my grandmother. We could easily sit for an hour or two together, going through the cheap PennyPress word search booklets. I also adored doing the puzzles as classwork or homework (an activity that often turned itself to creative expression with markers and highlighters and neat, careful lines). When in those younger years, word searches took me a bit of time. Often I scanned horizontally, vertically, to find the easy words my brain would pluck out, and then I would go down the list, one by one, searching around each letter: for instance, if searching for “apple,” I’d carefully find each “a” in the puzzle, then look around its adjacent letters, to see if I could find a “p” and follow that up by seeing if the direction then led me to find “apple.” Although I enjoyed the puzzles, they became certainly tedious to complete. 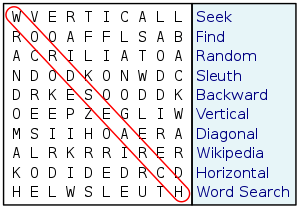 Lately, though, I’ve been doing word search puzzles again, and found a new phenomenon: after scanning horizontally, I go to finding the remaining words one by one down the list, as I did before. The process, however, is almost automated – I only have to scan the puzzle a little while for the word I’m looking for before I find it. In some cases, I can look back to the puzzle and immediately set my eyes on the word, even if it’s backwards diagonal (the hardest pattern to recognize) or short (the hardest to find because of its length). Word searches suddenly have become a breeze; rarely do I have to do the hunt and peck method I did as a child. Aoccdrnig to a rscheearch at an Elingsh uinervtisy, it deosn’t mttaer in waht oredr the ltteers in a wrod are, the olny iprmoetnt tihng is taht frist and lsat ltteer is at the rghit pclae. The rset can be a toatl mses and you can sitll raed it wouthit porbelm. Tihs is bcuseae we do not raed ervey lteter by it slef but the wrod as a wlohe. ceehiro. … but instead, when I was doing lyric slides for worship at my high school Christian club. I was told to make sure not to do the lyrics in ALL CAPS, because humans recognized words by their shape, and this is why regular fonts and normal upper and lower case use was best. This promptly made me wonder why elderly people insist on writing all communication in ALL CAPS BECAUSE IT IS EASIER FOR THEM TO READ THAN THE TINY LETTERS, and I’m not making that up – it’s what I’ve heard from countless elderly computer users. While there’s certainly some weight to the word shape recognition theory, there’s also weight to the fact that our brains are capable of far more than just realizing the shape of a word. They’re capable of unscrambling letters swiftly in context, in identifying words when the l e t t e r s are spread out in a less recognizable fashion, and of actually skipping over connecting words while reading and letting the brain fill in the rest based on contextual clues from subject matter and sentence structure. They’re capable of letting us learn multiple languages, even as adults; capable of doing the same behaviors in our native language as our learned language, even capable of thinking in new languages. To be blunt, the brain understands more about language, word recognition, and reading than we do. It’s a fascinating sort of magic that cognitive psychologists are still studying, and still have much to learn. In the meantime, I’ll happily enjoy the magic workings of my brain, even if it can recognize whole words in word search puzzles, yet get caught up on the spelling of small simple words. This entry was posted in reading and tagged cognition, language, Word Games, word recognition, Word search. Bookmark the permalink.